Bundled by B&H for your convenience, this Zoom F4 Multitrack Field Recorder Kit provides the aforementioned field recorder, an ORCA OR-28 Mini Audio Bag, and an ORCA OR-28 Bag Harness for carrying it all around the set. The recorder offers low-noise preamps taking in audio at sample rates and resolutions up to 192 kHz/24-bits. 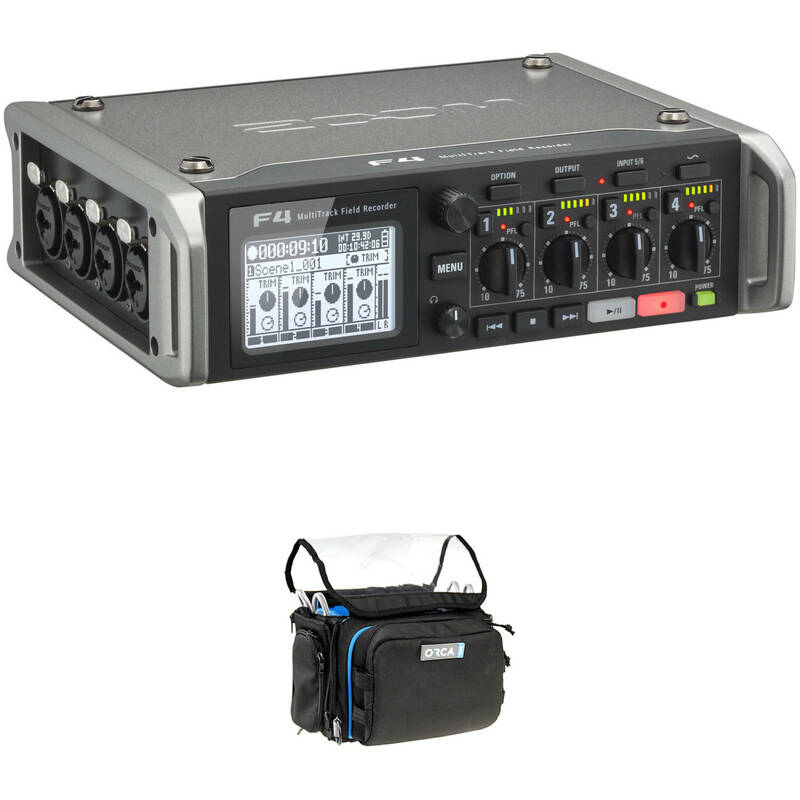 It provides six inputs, including four combination XLR-1/4" jacks, a 3.5mm stereo in, and a Zoom mic-capsule input. The ORCA OR-28 Mini Bag sports an internal honeycomb frame to protect the F4, as well as a transparent TPU top, two handles, and multiple pockets. The harness helps distribute the weight of the F4 while you operate it in the field or on set. Two pockets are on hand for your accessory gear, and you can position the F4 in multiple ways within the bag. Designed to provide big Hollywood sound on an affordable indie budget, the Zoom F4 is a 6-input / 8-track professional field recorder featuring super-low-noise preamps and timecode with pinpoint accuracy. The unit provides recording and playback resolutions up to 24-bit/192 kHz with impressive audio specs including an extremely low noise floor (-127 dBu EIN) and high gain (up to +75 dB), with +4 dB line-level inputs. The on-board temperature-compensated crystal oscillator (TCXO) generates timecode at 0.2 ppm accuracy and supports all standard drop-frame and non-drop formats, as well as jam sync for external devices. The F4 offers four combo XLR-1/4" inputs, a 1/8" stereo input, and includes a Zoom mic-capsule input for recording six discrete tracks with an additional stereo mix, all at full 24-bit/192 kHz resolution. With gain linking capability between the various inputs, the F4 is suitable for recording audio in VR formats, specifically Ambisonics. Plug in a mic like the Sennheiser AMBEO, for example, and you'll find you can control all four capsules at once from the F4, and thus, capture the 360° audio necessary for immersive entertainment. Additionally, inputs 5/6 can function as a camera return for audio-monitoring only for confidence checks, or can accept two additional mic/line signals via the EXH-6 combo input capsule (available separately). The dual-SD card slot features simultaneous recording to both cards allowing you to make a backup or split recording with all eight tracks on one card and a stereo mix on the other. The front panel offers an output button, which provides quick access to the unit's outputs, while the option button offers quick access to TC Jam, Trim Link, Clear Clip and other important shortcuts. An easy-to-read 1.9" LCD display is suitable for use in all lighting environments including dark low-light sets to bright sunlight. The on-board mixer not only provides user-adjustable level, pan, and input/output delay, but also offers high-pass filtering for noise and wind reduction, phase inversion, and Mid-Side decoding. The F4 ships with a camera-mount adapter, a DHC-1 DC-HIROSE adapter, an AC power adapter, and download codes for Cubase LE and Wavelab LE. Box Dimensions (LxWxH) 11.6 x 10.4 x 4.9"